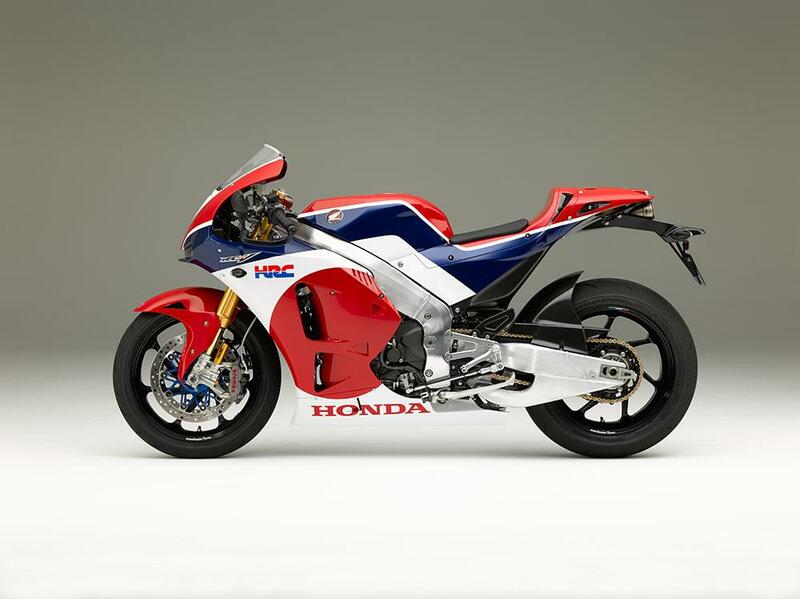 Honda’s long-awaited RC213V-S really is a MotoGP bike with lights and as close to the real thing as is practical and affordable. It’s tiny, like an NC30 and floats effortlessly around a track. In standard trim it promises to be a sublime road bike and is reminiscent of an RC30, even if it’s slightly docile on a circuit. But with the optional Sports Kit fitted it’s something very special. No mass-produced road bike can ever get close to the RCV’s hollowed-out weight, its directness or easy speed around a racetrack. And all that MotoGP performance is on top of a machine that’s a work of art standing still. Although Honda has produced some of the most exciting and dominant racing machines of the modern GP era (700 wins and counting), that passion for speed rarely comes across on their road bikes. But now it does with the decadently brilliant RC213V-S and for that, Honda, we salute you. It’s the size of a 400 and feels like a compact, agile, ultra-smooth, modern-day RC30. The ride quality has the kind of plushness only a factory racer is capable of and the RC213V-S never flinches, no matter how hard you push in the corners. On track you can easily find the limit of the standard brake pads and Bridgestone RS10 tyre, but on slicks, with the Sports Kit pads and 10kg weight reduction it’s every inch a genuine MotoGP machine. In a bid to create the lightest, most agile and stable machine, attention to detail to the chassis and weight distribution borders on the obsessive. 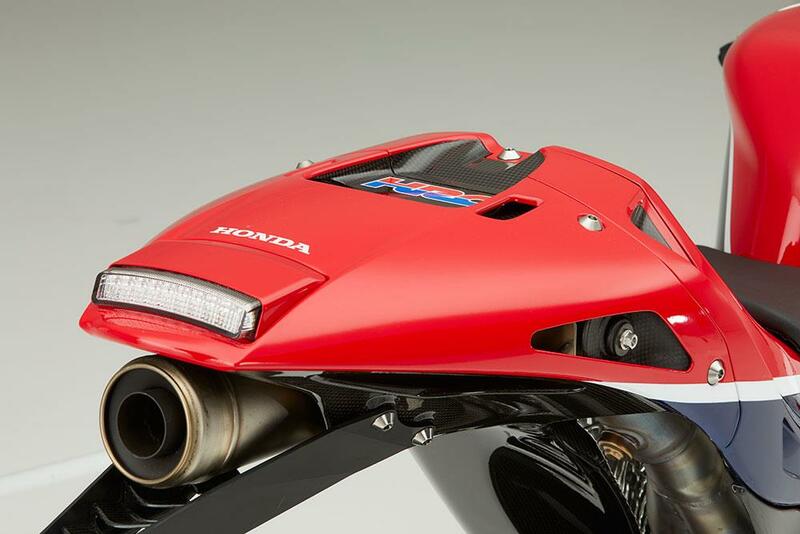 The beautiful, hand-fabricated frame and underbraced swingarm, made by Moriwaki and assembled by HRC is the same as the racer and created using differing thicknesses of aluminium for strength and flex in key areas. The steering head is adjustable, but less aggressive than the factory RC213V and the 1465mm wheelbase is a massive 55mm longer than a Fireblade’s for stability. Titanium fasters are everywhere to pare weight down to the minimum. It weighs 170kg dry and 160kg with the road gear removed and the Sports Kit fitted and road gear removed. Based on the factory RC213V powerplant, first seen in 2012, the ultra-compact 90° V4 motor produces just 159bhp in road trim, but with so little weight to push along the Honda still accelerates with venom. Despite the performance the throttle control is flawless and the power delivery glassy-smooth, which makes the RC213V-S a doddle to ride fast or slow. With the optional 215bhp Sports Kit fitted it’s a whole different animal. With its extra revs it accelerates harder than any road-going superbike, but the V4 motor still manages to be easy to control and sounds just like the factory bike at full song. With its race pipe fitted it produces an ear-splitting 116db and spits on the overrun when the engine braking electronics are doing their thing. The engine has the same diminutive dimensions as the old 2007-2011 800cc RC212V motor and features sand-cast aluminium crank cases, composite nickel-plated bores, carbon fibre airbox, titanium conrods and valves, just like the factory RC213V. Unlike the racer the motor doesn’t have pneumatic valves, but runs a conventional valve spring set-up like last year’s customer RCV1000R. Unlike the factory machine the road bike doesn’t have a seamless-shift gearbox, but uses the same conventional cassette-type gearbox, taken from last year’s RCV1000R ‘Open’ bike. It has an assist and slipper clutch, giving a light feel at the lever and controls rear wheel hop during aggressive downshifts. Build quality is exceptional and in road trim the RC213V-S has the same 4000-mile service intervals as any other road-going Honda. But with the Sports Kit fitted you need to check the motor every 3000km. The RC213V-S isn’t cheap but that doesn’t mean that it isn’t good value for money. The bike is very close to the ‘Open Class’ RCV1000R that was raced in 2014 by Scott Redding and Nicky Haydon. Those bikes cost €1,000,000 to lease and the same again to run. Think of the RC213V-S in those terms and, yes, it’s expensive but not overpriced. Put simply, the RC213V-S is hand-built perfection and every square inch of the machine is exquisitely built, from the fabricated Moriwaki frame and swingarm, to the fuel tank that disappears under the seat for perfect mass centralisation. 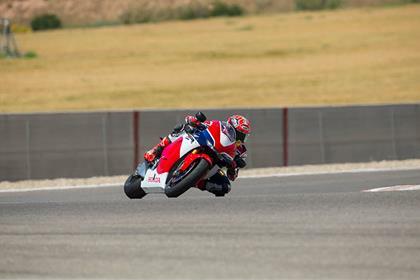 For the first time on a Honda road bike the RC213V-S has a host of cutting-edge rider aids, controlled by a ride-by-wire throttle system and six-axis Inertial Measurement Unit (IMU). There are three power levels to chose from, nine-way adjustable traction control, four-stage engine braking control, a quickshifter and five ‘mix and match’ riding modes. Launch control is available in the Sports Kit. Pegs are six-way adjustable and for the first time on a Honda road bike the RC213V-S comes with a quickshifter for clutchless upshifts. Only ever seen on top-level race bikes, with the exception of Ducati’s 2007 Desmosedici RR MotoGP replica, the RC213V-S is fitted with fully-adjustable Ohlins TTX25 gas forks. The latest-generation fully-adjustable Ohlins TTX36 shock lives at the rear. There’s no ignition barrel, so the top yoke is racer-clean and the rotary steering damper fitted to the bottom yoke is lifted off the 2014 RCV1000R. Forged magnesium 17” wheels are shod with Bridgestone RS10 road-compound trackday tyres. 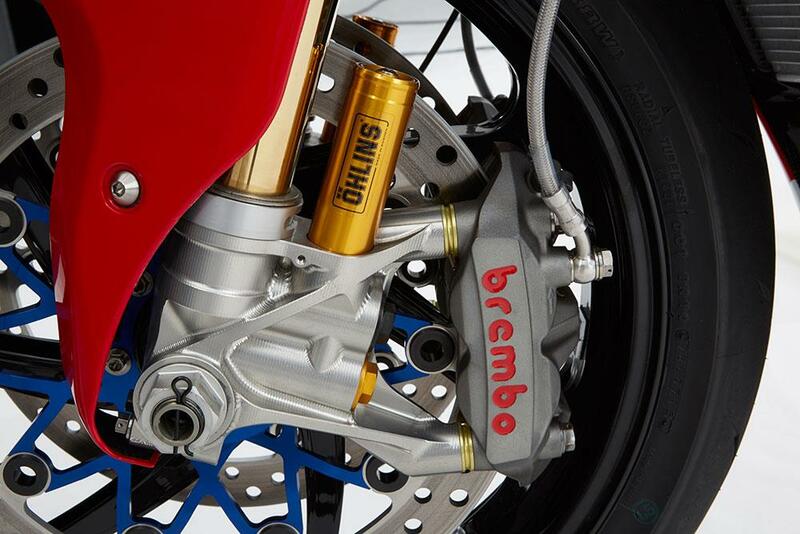 Steel discs and four-piston Brembo four-piston calipers are similar to the factory bike’s wet-weather set-up. Mirroring the race machine’s styling, the fairing, self-supporting seat unit and tank cover are made from carbon fibre. But unlike Marc and Dani’s bike the RC213V-S has LED lights, bar-end mirrors, side-stand, starter motor, number plate holder, horn and ‘Honda Smart Key’ keyless ignition. Just like the new R1 and 1299 Panigale, the RC213V-S has a slimline, full colour Thin Film Transistor (TFT) dash, featuring Circuit, Track and Mechanic mode displays, packed with information form time, date, revs, gear position, riding mode, temperature, lap times and everything in between. 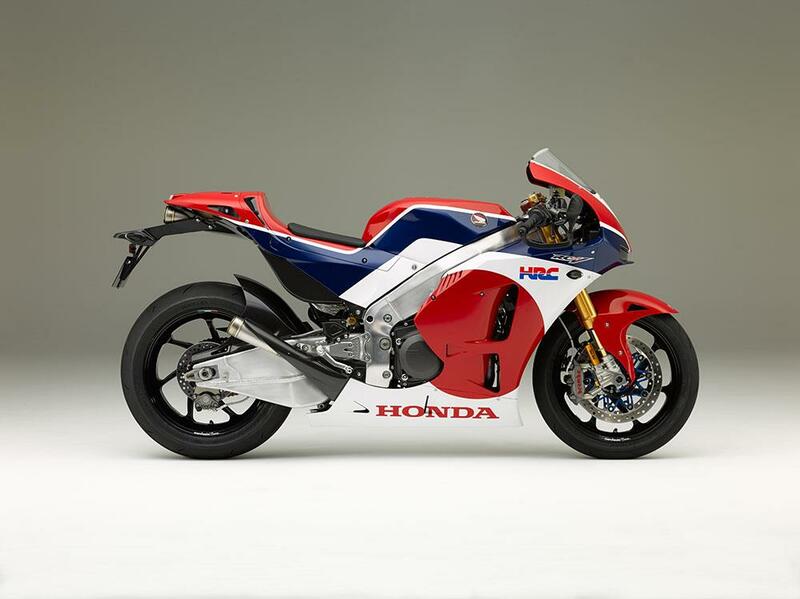 2015: Honda begins hand-built RC213V-S production. A small team of engineers build one machine every two-three days. Honda plan to build around 250 before the end of 2016. 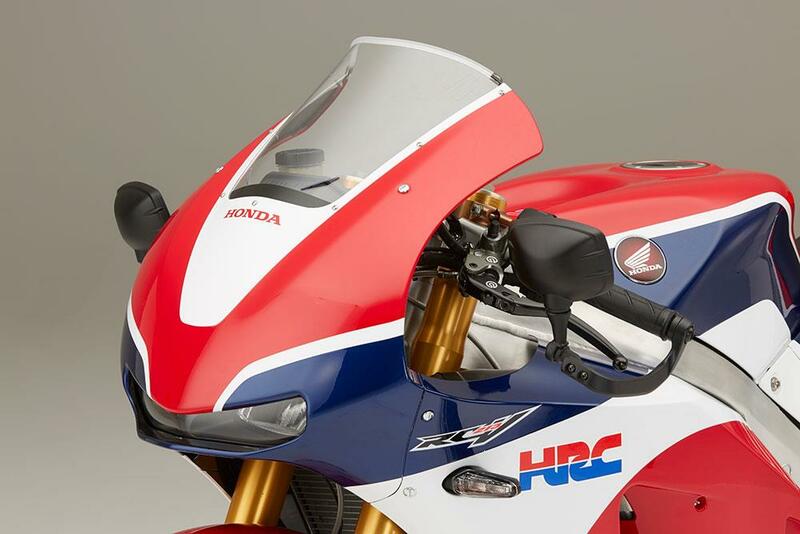 No owners have yet reviewed the HONDA RC213V-S (2015-on).